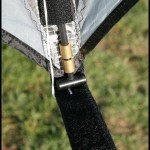 Weight: 12.6 Oz. 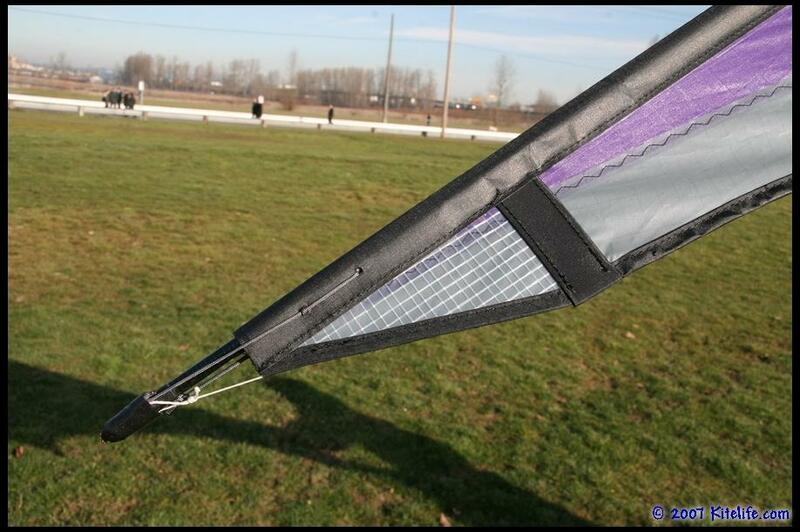 Type of kite: Polyvalent. 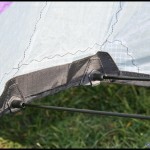 Materials: Dynamic 15, T18 frame, PC31 Ventex polyester sail, injected leading edge and t-piece connectors by Flying Wings. 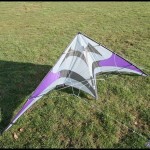 Source for test kite: Manufacturer. 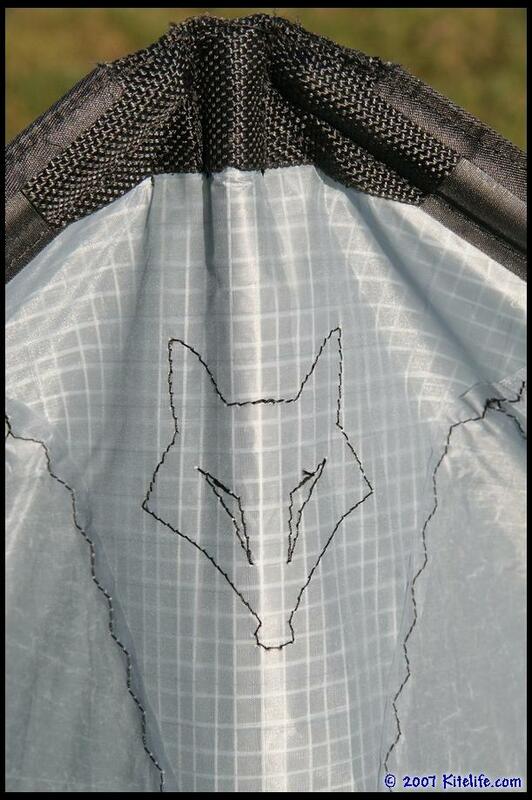 It’s been interesting watching Flying Wings progression into more and more advanced sport kites over the last couple of years… Last year Bell Chiu from Taiwan released the Acrobatx with Flying Wings, and has taken it up another notch this year with the Silver Fox. 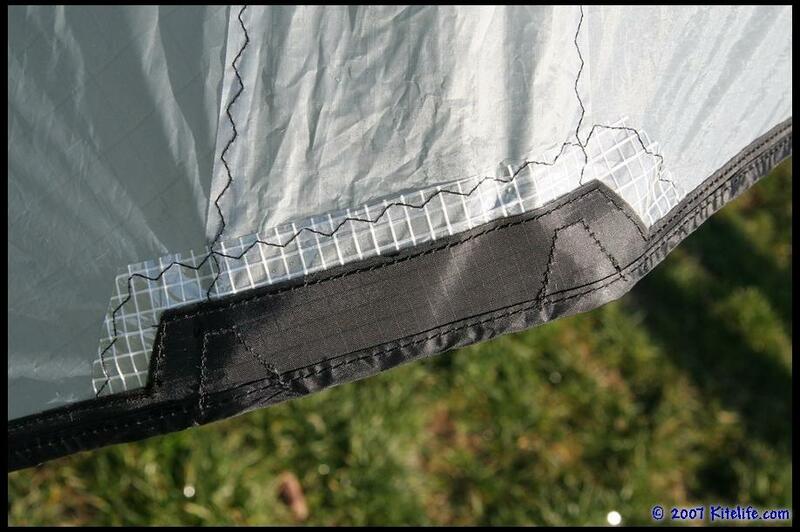 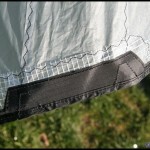 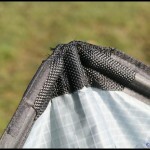 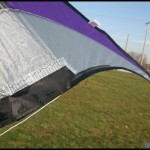 With zig zag stitching throughout much of this kite, with a mylar reinforcement along the length of the spine, plus mylar and dacron reinforcements in the trailing edge and standoff attachments, many of the weaknesses you would frequently encounter on a kite in this price range are sufficiently covered. 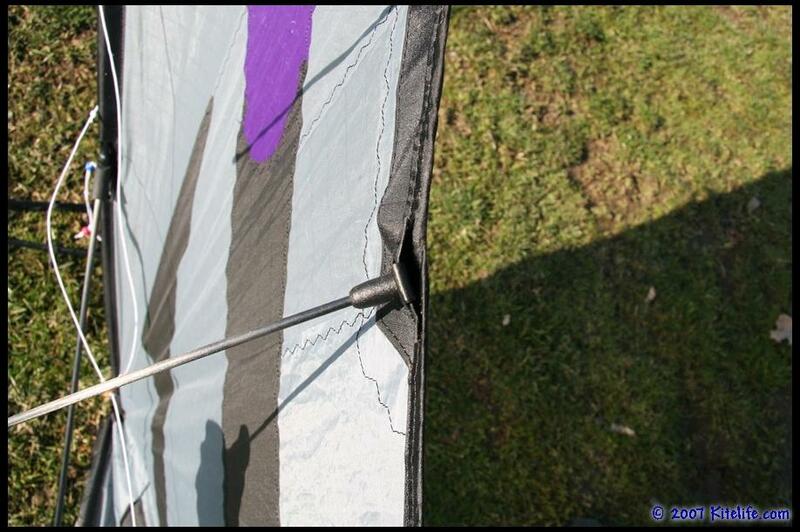 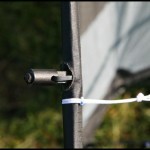 Additionally, Flying Wings has incoporated many features generally found on high-end kites, such as covered stand-off attachments, covered upper and lower spreader connectors, a snag-free nose, a center outhaul line which also serves to keep the bridle from snagging on the tail. 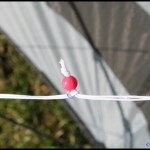 The yo yo stoppers are also made of a denser material than we find in APAs, and seem to be far less likely to get sliced off during aggressive trick flying. 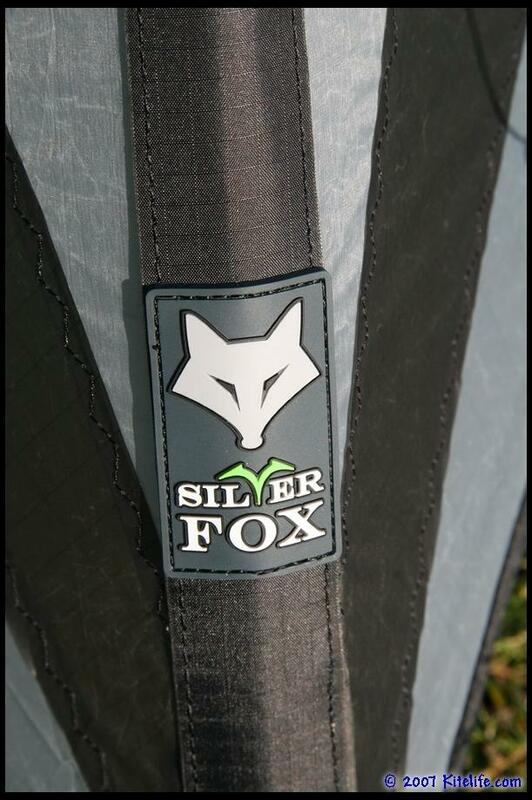 Featuring a “Turbo Beads System”, the unique bridle on the Silver Fox utilizes a bead system that quickly and easily lets you change settings between either a 3-point or turbo bridle setup. 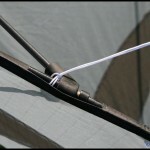 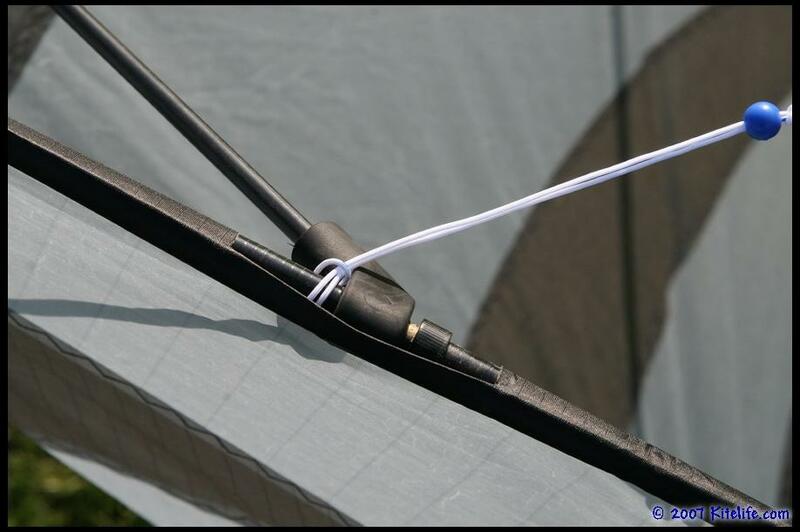 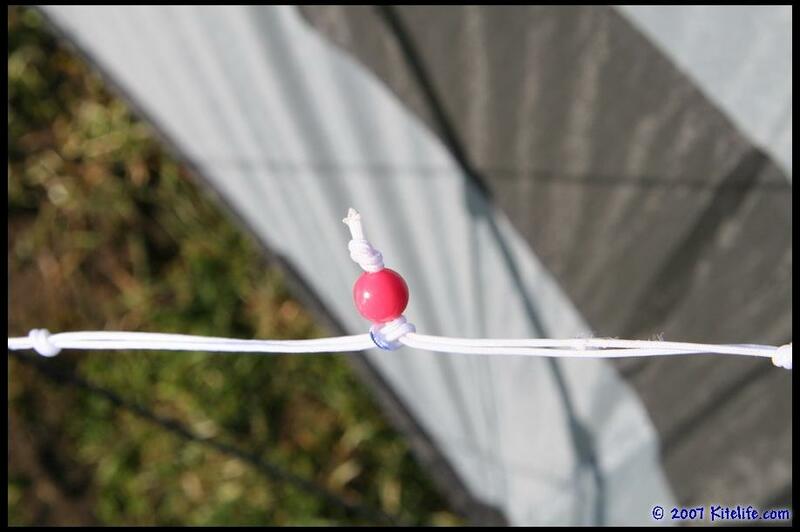 It takes all the pain out of changing the bridle on your kite, by color-coding the the bridle connection points… A truly great feature for pilots who are still learning about high performance sport kites. 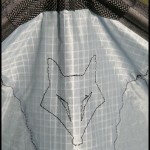 The Silver Fox STD comes pre-installed with removable .04 gram ballast weight and .06 tail weights, which we had no cause to remove and found to be an ideal balance for the kite, right out of the bag. 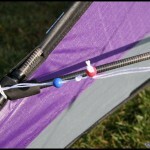 Blue settings (Turbo)… Great slot machines, solid comete and Jacobs Ladder (although it seemed a little sluggish in the turtle), cornering not as crisp as the 3-point setting, seemingly more ideal for trick flying and individual or high wind flying. 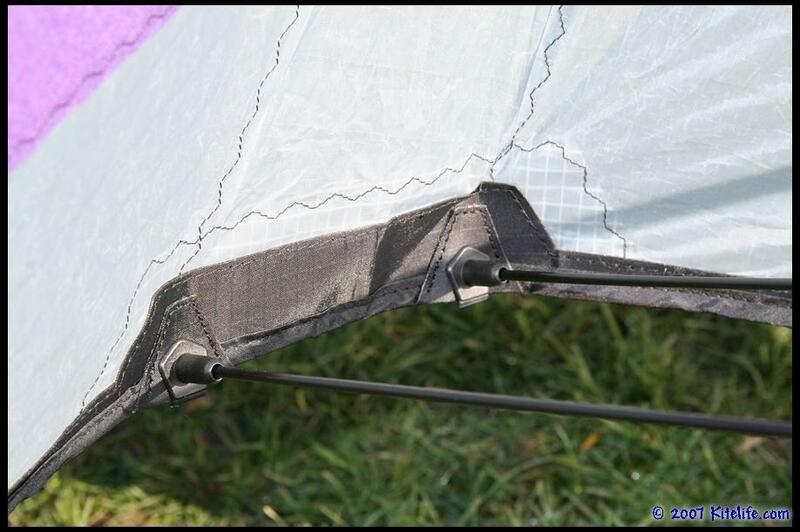 Red settings (3-point)… Easy insanes that stayed locked in for us even in low wind, seemingly easier and more natural cascades and half axels, more ideal for precision Flying, team, or low wind flying. 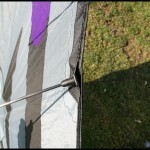 The winglets on each side are somewhat flexible, made purey of heavy duty dacron tape, giving the effect of winglets without causing too many tip wraps in the process. 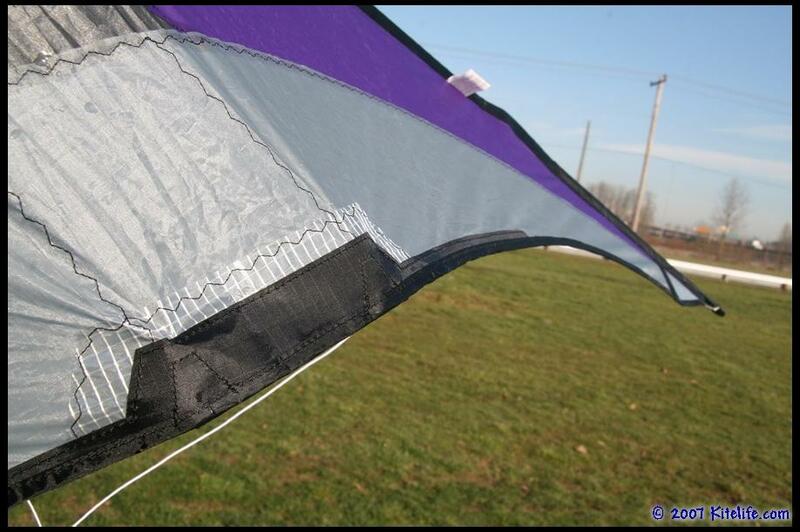 Although this kite has an advertised wind range of 3-20 mph, we only had the opportunity to test it in light and medium winds… In the light winds, we found the kite to be a bit on the heavy side but still responsive, and it really came into its own as we went over 4-5 mph, maintaining or improving its performance level as we got into wind ranges of 8-12 mph. 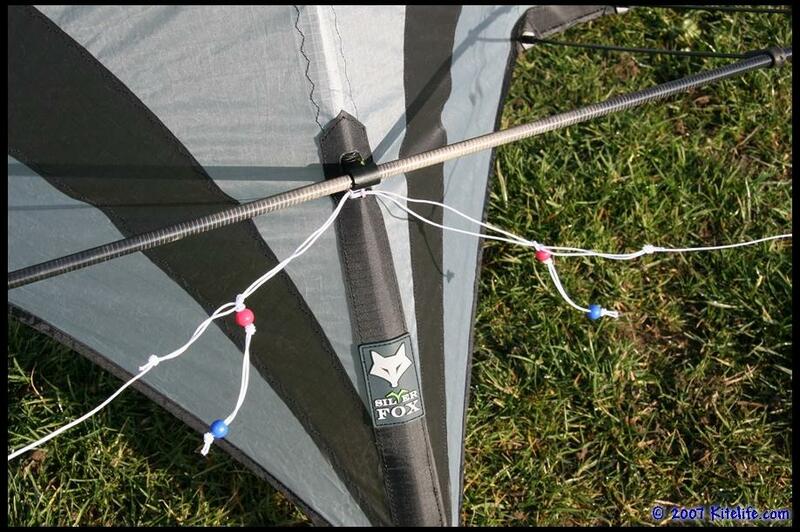 We had concerns about the flexibility of the spars at first glance, but the structure and construction of the Silver Fox did a fine job of balancing the load, keeping flex at a reasonable level across the whole kite… Stiff enough to maintain its shape during fast, powerful maneuvers. 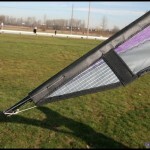 A medium puller, this kite provides enough loading and pressure to give you a good connection with the kite, without overpowering the pilot. 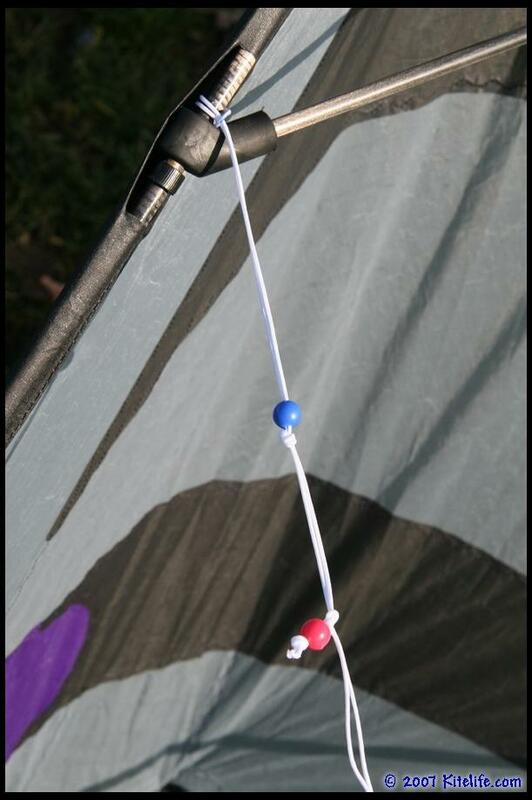 Preferring an extremely well-loaded kite with drive, we eventually left the bridles set on 3-point and adjusted the vertical down by approximately 1/8″ without causing any excessive oversteer. 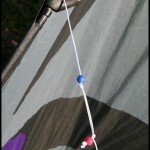 In our brief experience with this kite, the Silver Fox’s strongest tricks were the Lazy Susan, Kombo, Comete, Jacobs Ladder, Backspin and Multilazies, very good combination ability, easily transitioning from one maneuver to another… Old school tricks were more than satisfactory as well, with firm tip stabs (Spike) and Ollies. 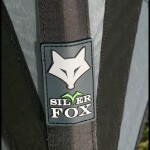 Fades were a little loose and twitchy for our taste, but could be managed with a little added tending of the controls… Other than that, we didn’t find the Silver Fox STD to be particularly lacking in any trick area. 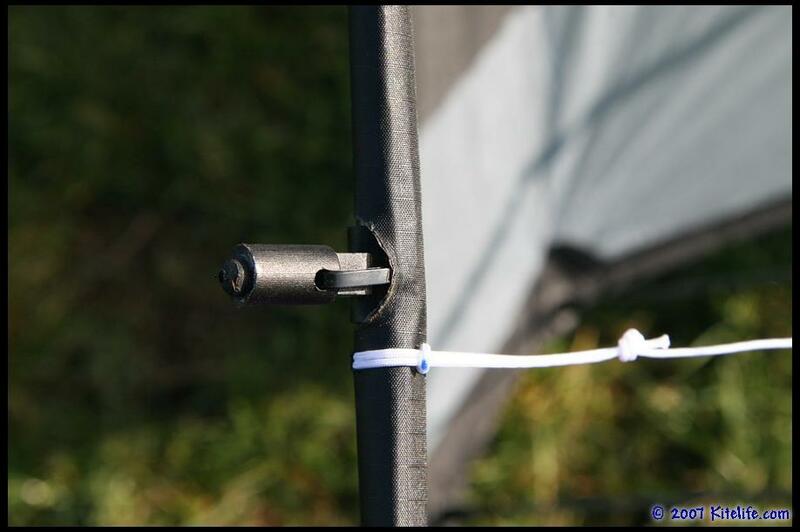 While the corners were a little rounded (soft) on the Turbo setting, the 3-point configuration offered a very solid level of precision. 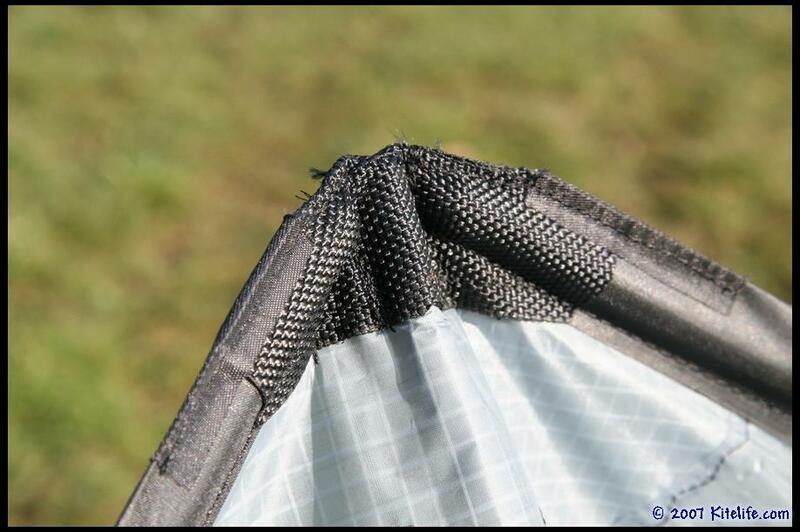 Corners are sharp and snappy with relatively little wobble or oversteer, tracking is good and forward flight is a nice medium speed. 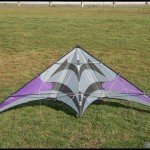 Without reference to design facets, the Silver Fox STD gave us a flying experience blended somewhere between a Transfer, Sea Devil and Freestylist… Generally crisp precision like the latter, a similar feeling on it’s back to the Sea Devil and wide-wing handling (inputs) like the Transfer. 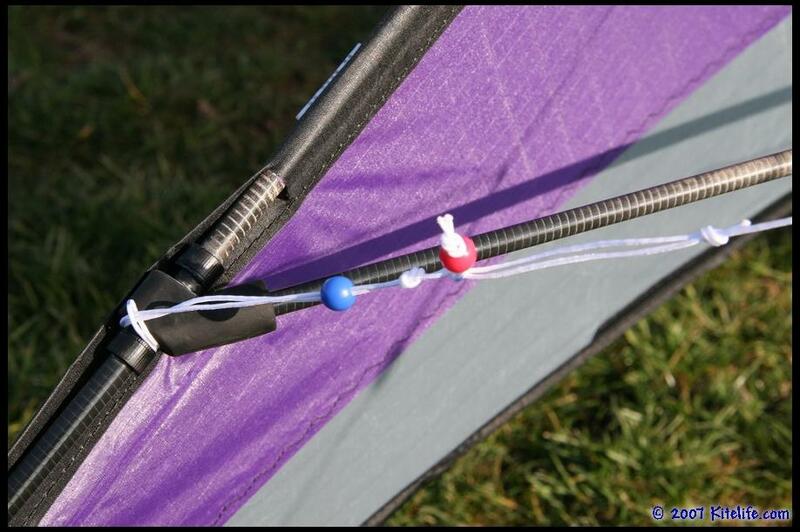 Other tricks we were able to regularly reproduce on this kite include the slide, wap-do-wap, yo yo, multiple yo yo, flip flop, yo yo multi, lewis, flapjack, superstart (k2000), rolling cascade and two-point landings. 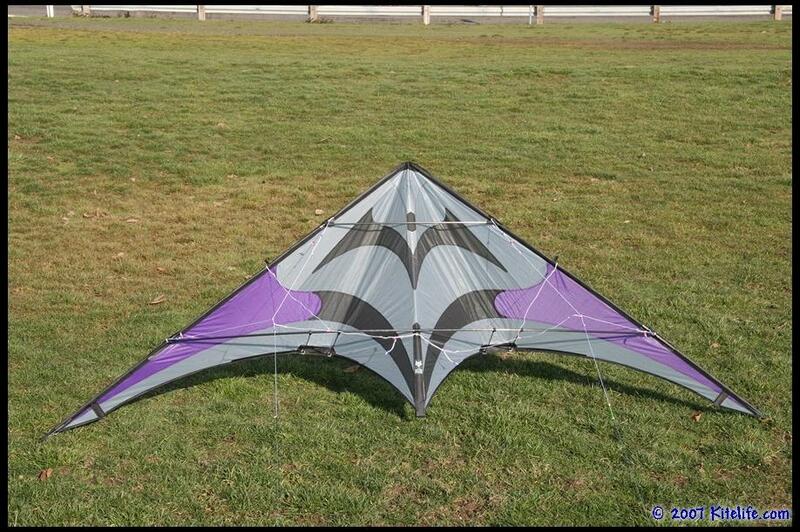 Naturally, with an MSRP of well under $200, the Silver Fox may or may not have the elegance of more exotic imports but it does offer something quite close enough to make this an amazing value and an excellent mid to high end flier to learn those more complicated tricks on without endangering a major investment. 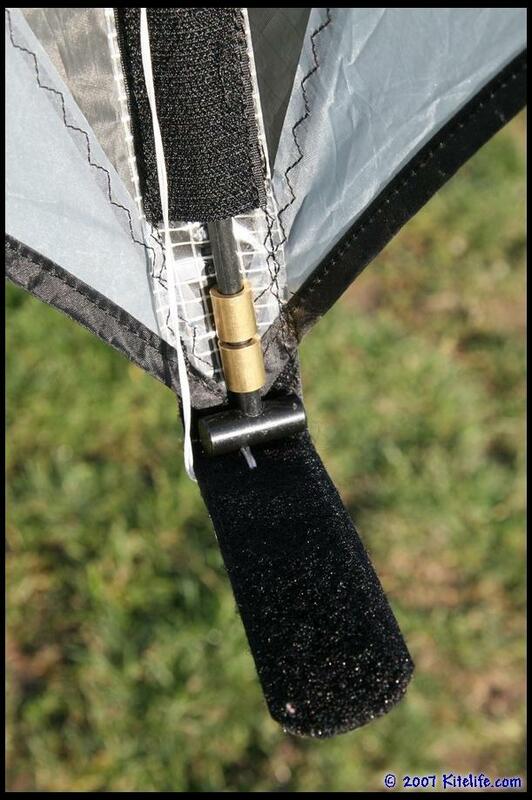 Spars and parts are also a little less expensive than what are frequently found in higher end kites, making replacements a little less painful on the wallet, provided your favorite shop carries them. 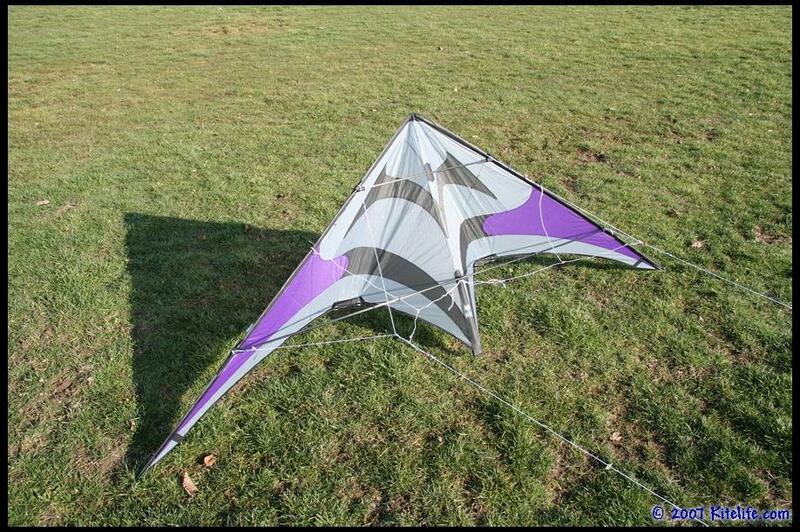 Pound for pound, Flying Wings has hit it well out of the park on this one… In our opinion, the best overall performer available for the price at the time of this article, we’d recommend it to anyone except absolute beginners. 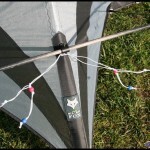 This entry was posted in 2007, Dual Line, General Topics, Issue 53 (Mar/Apr), KL Archive and tagged a wind of change, review, silver fox, sport kite, tricks.